Dear Kalei, I want to thank you from the bottom of my heart. Your reading at the last year Lemurian retreat, your love and spirituality have been life-changing. I followed your advice, the message you gave me from the ancients and the spirits, and it worked! And look at this! I married my divine twin flame! Love you, Kalei! I want to thank you so profusely for the incredible gift you gave to me of insight. My life has changed so radically from that moment forward. I am now freed from victim-hood and can take responsibility for my having set up the lesson in everything in my life. It's a very weird feeling! I also want to remind you that on the day you gave me that reading (my similarity with Angry Jessica!) I got a phone call just afterward that was a phone interview for a job. I had the in person interview today and got the job. It's not a big fancy job but a real job helping people on houseboats with limited income bring their houses up to code. I used to live in the houseboat community, so it's a way to go home for me and do something meaningful with people I care about. I am ever grateful and will always know you as the one who took me up the mountain to see the light. She had tears in her eyes listening and I made a affirmation just for her. I wanted to thank you dear beautiful Kalei for your wisdom and for your really cosmic love to all of us and to all creatures of this wonderful earth. I feel your love so much that it seems to me that I can touch it - it is substantial! I am drawn to send this message as a reflection back to you of the Love you shared with my husband and myself in Maui and in your email responses since. My spiritual path and process has intensified and deepened in the early months of 2013. Throughout this process the words you so generously offered me have served as an anchor and guide to my process. I do not believe I would have recognized or had the same degree of courage in facing what was being shown to me without them. It feels important to me to let you know how profoundly impactful the words that you offer others from that wondrous place of love, really are. I wish to offer my heartfelt thanks for the gift of your 'Love Words', Kalei; they have been and remain with me like a treasured friend. Thank you so much Kalei'iliahi for your blessings at the Lemurian Choir Reunion in December. It was absolutely beautiful. People were crying each time you spoke and from the moment you opened your mouth. I sat next to a Latino man on the 21st, who cried all morning. It was so powerful. Thank you, thank you. I just realized I forgot to say that I was crying too. You touched so many hearts that day and Thursday night as well. I'll never forget it. You are one of the most beautiful and powerful goddess energy I have ever had the privilege to know. I deeply honor and love you for what you are, shining stars of wisdom and love to all humanity. Hello Sister.... I wanted you to know that I am honored to have friends who have shared fantastic experiences of there sessions with you!.... I wanted you to know You Are Most Dearly Loved!!! Mahalo again, Kalei for the empowering Pele Ceremony we had with you in January. We practiced the E KU MAU MAU a lot, until everybody connected deeper with their power within. Mahalo too for your beautiful artwork and your love. Everybody in the group felt so welcome by you! Coming from Germany it is always very heart opening to see, a woman can be loving and soft, even sharing tears AND be strong at the same time! I will let you know as soon as I am coming with a new group.... possibly even in August. I wanted to thank you once again for the beautiful counseling that you gave Shelly and I last Saturday. Ever since I feel so much more excited about my life here in Hawaii. In the picture you see me with my boyfriend Michael. I wanted to let you know how much the 12-12-12 ceremony meant to me. So many vague feelings were clarified for me in your messages. Thank you for sharing so divinely your spiritual mana. I am very grateful to have met you along my journey this lifetime it was indeed more than an honor to have been in your presence and to have experienced the many channelings, blessings and helpful guidance from you! Your such an extraordinary woman and soul! Mahalo again for a most moving and powerful experience on 12-12. I keep my pebble near to me to remind me of who I am. My friend who also attended put it well, she said she feels validated. And we move forward feeling excitement in this new energy. You are a rare being, and have much to say. It has been so wonderful to be able to be with you and the friends. I just want to give my friends the best and I know that you are the best for all of us. Pure heart, integrity, love and openness. That is what we all deserve right? I want to thank you from the bottom of my Welsh/Lemurian heart for the ceremony honoring Pele on 12-12-12-12:00. What a pleasure to finally be seen. You said to expect miracles, and so I have been on the look-out. I experienced a great one this morning. I drove through Starbucks and the guy in front of me paid for my drink. I was so thrilled that I paid for the woman behind me. The workers were so thrilled, and they said they hoped this was a train that would go on all day. I prayed for that. Thank you for blessing us with your courage and mana. It was a privilege and a blessing to be with you and the other Returnees. Finally, I am starting to feel at home. I wanted to sincerely express my gratitude to you for the intimate connection you possess with your lineage. I remember very clearly, and hold with such gratitude in my heart, the tears and emotion that arose while you were sharing with us at the Lemurian tonings. Never before have I felt this connection with my Lemurian lineage, and I will always hold this experience so dearly. Once again many blessings to you for your Beingness...with love and deep gratitude. "Dear Kalei, you have been my friend for about 20 years. We met long before you returned to your beloved Hawaii. You at that time were and still are a magnificent artist, in fact that is why I bought for my husband, who is also Hawaiian, your Pele. We both loved your capturing of her. Months later, I was fortunate enough to meet you and bought your high priestess and high priest angel pictures at a Kyron conference. I have in my art collection many of your angels and recently have been able to aquire on of your latest pieces, as a wedding gift for my daughter. Since our first meeting, I have been blessed and been able to experience your psychic and deep kahuna healing abilities. 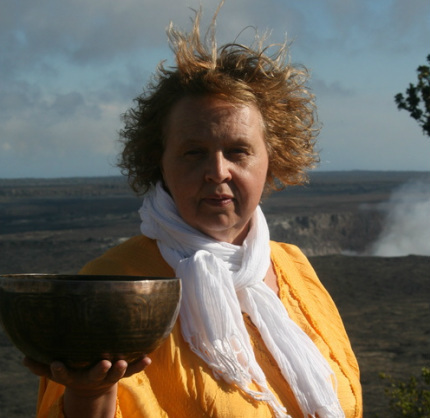 Your ceremonies are pure magic with a deep heartflet connection to Akua and the goddess Pele. Mahalo for being in my life and blessing this mother earth with your presence and abilities." "As a travel specialist and journalist in inspired pursuits for many years, with my company Passionate Travel, I have been privileged to research, experience and share many life experiences for myself and for clients and readers. One of the most memorable was my time on the Big Island with some of the most amazing kahuna and light and energy workers who truly embody the Aloha spirit. My initial experience at the volcano with a Pele experience with Kalei was definitely something that was something that I will never forget and has influenced my life to this day in many positive ways. Her most distinguished lineage, her talents and gifts are truly special. I have been privileged to host her in Vancouver BC and have seen her work, inspire, help and influence many people. She is also a very gifted artist and she combines the most beautiful talent, passion, spirit and energy to all of her work which embodies the everything spiritual and beautiful about Hawaii, its people and what makes it such a special place. Her use of color and the absolute detail make her work stand out from most other people who portray Hawaii in their work. 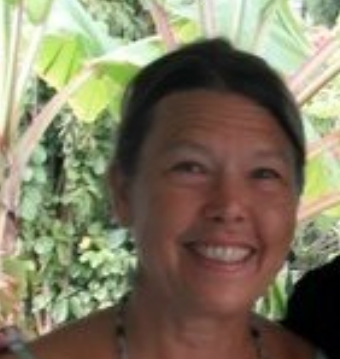 She epitomizes the Aloha Spirit." "Kalei is an inspiring, wonderful person. When I was having a meeting and reading with her she first introduced me to her friend, the tree Miracle before we sat down under it in that way showing me what great respect she has for all living beings of the Earth. I can't thank Kalei enough for what she helped me see, and experience. She brought me back to the core, to my heart and my heart started singing; YES!!!! Life is Joy! Love you Kalei"
The session with you has completely changed and uplifted my life. I can't thank you enough. You are one of the most loving people I have ever known. The sessions with you are always full of light, love and inspiration. Each session inspires me to the next level. Each one is so precious and has made great difference in my life. You have such a profound insight about what is importance to my growth. Your guidance and advice is always right on and illuminating. You have helped me to relieve some major blockage to my life progression. You helped me see my own worth and light. You are one of the few people who have impacted my life and my personal growth in the most significant and profound way. My life has never been the same after I met you. I am very grateful and honored to have you in my life. What an up lifting, wonderful, sweet and powerful experience I had with the time I shared with Kalei. Time that she generously offered to do an in-depth healing on my soul. The blocks that she took away from me, and her ancient wisdom and love, were of an immense support and spiritual growth. I am blessed and fortunate to know Kalei, and I can't wait to see her again. I know Kalei is here to fulfill a very high purpose and I am glad to know she is around! All the love and great energy to Kalei, beautiful and incredible soul. Meeting and working with Kalei was the catalyst for life changing spiritual growth. It helped me open the door to my authentic Self, and provided tools for the journey. It connected me to my roots. Its not that Kalei’s work displays mastery and beauty… that much is clear. Her art goes beyond and accomplishes what all great forms of expression do. It welcomes you into the experience. I can literally feel the talons of the bird and its weight on my arm in Pueo Princess,and the ever present breeze off island waters that lifts long hair and moves adorned leaves. One can hear and see the graceful story her hands have just told….. or will begin to. Ultimately, the profound comfort and love of the energies that enfold her - enfold me too. Kalei’s art is a gift and a transformation. I am grateful for such a blessing in my home. I am deeply grateful for the sincere love, wisdom and spiritual insights that you have generously offered me in our times together over the past several years. In our sessions you channeled Spirit’s guidance in a way that connected me to my Ancestors, Guides, and Highest Divine Self. Your reflection of my own Divinity is profoundly validating of my purpose on this Earth plane. Your consistent support of the shift in consciousness that I seek, to live fully from a higher vibrational frequency, has been instrumental in helping me tap into my inner strength and knowledge. Your ability to “see me” at the Soul level validates my life purpose. This is a time of quickening, of great challenges for me and others in my ohana. Your healing energy is needed on Earth at this time to help guide us through the portals to other realms, to expand our awareness and actualize our potential as human beings. You are a treasure, a gift from Royal Ali’i lineage for sure ! A session with you has value beyond measure. Mahalo nui loa for offering your healing gifts and for sharing the knowledge of your Ancestors and Guides in your readings. Often I feel Pele’s presence supporting my healing process; your artistic rendering of Goddess Pele, as well as beautiful depictions of angelic beings, are exquisite and touch my heart. They are a wonderful expression and complement to your power, grace, and beauty. May you thrive and flourish in boundless health, abundance, and well-being in a golden field of unconditional love filling your heart to overflowing with all the appreciation I can bestow." I would like to tell everyone about my meeting with you, and my first phone conversation concerning my angel Troy. My thirty nine year old son was missing, I went to see Olena, and she suggested I contact Kalei, which I did, she offered to meet with me after her function that day. She told me Troy was on his way to heaven, explaining life on earth was so difficult or him, but he would do wonderful things in heaven, he wants to help the disabled veterans, and the alcoholics who so need his help. About a week later Kalei called me at home, told me Troy is a beautiful angel, he has such a beautiful glow around him, he loves you, and wants you to know he is alright, he will send you feathers to let you know he is okay, and for you not to worry. Kalei laughed and told me you will need to get a basket to keep all the feathers in. After my phone call with Kalei, I went took a shower and came back into my bedroom to put lotion on my body, I lifted my foot up to rub lotion, and there on my big toe was a feather. Troy was there letting me know he is okay, and for me not to be so sad, because he is okay. many times I can feel his presence, and then I will find a feather, and know he is okay. A mother always worries about her children in life, and even after God has made other plans for them. Troy loved the ocean, swimming, surfing when he was younger, canoeing, snow boarding, I so pray he can do these things in heaven, too. Kalei is a beautiful, spiritual person, who helped me immensely to understand why my son needed to go to heaven, she was there for me when I needed her. Thank the Lord. God Bless You Kalei, you will do well with your beautiful art work, and your spiritual healings." On several occasions in my lifetime, I have been in need of comfort, or support and at times guidance, as to which direction I needed to steer my life at that moment. On those occasions, there was one person I knew I could always count on to be there for me. I could rely on her to guide me in her wisdom with her God given gifts and to set me on the path I needed to be on. With ease, it seemed as though her infinite wisdom would resolve any issues life may have presented to me. Most memorable of all, I recall that the sound of her voice was as healing as her words for it would not only comfort me, but it would quiet the pain I was experiencing. Kaleiiliahi , is not only an extraordinary spiritual healer, I also believe she is a gift to us from God because to be able to accomplish both tasks of giving us “true” guidance and to help eliminate pain with the mere sound of her voice; it is truly astonishing. My first experience with Kaleiiliahi was about 12 years ago when my husband passed away. Incidentally, this reading with Kalei was unsolicited. Kalei and I were having a conversation when she had a spontaneous visit by my late husband with vital information for my son and I, who was 10 years old at the time. The words from my late husband were not only special to us, but it was the timing of it all, that were priceless because we were not expecting it. This helped our grieving process more than she could have ever imagined, especially for our son; he lost his father at such a young age and so suddenly. My second experience I recall is when we lost our pet dog; he had gotten out of our front gate and had been missing for several days. To make matters worse, we had just suffered the loss of our other family dog of 15 years the same day Ziggy had gotten loose; needless to say, our family was devastated. Once again, I called Kalei in hopes she could give us if nothing else some inkling as to where we may be able to find our beloved pet. Once again, just by hearing Kalei voice, I seem to immediately find myself at peace and I just knew that Ziggy would come home. Kalei gave us details as to where our dog was and that the people who had him wanted to return him, but didn’t know how to get him back to us. She gave me specific instructions on what steps I should take on getting him returns safely to us, all of which I did to the letter. The very next day we received a call from the Humane Society we received a call back stating that someone had our little dog; we went there with a gift basket for them and retrieved our Ziggy. My third experience was a year ago when I began having headaches; I sought out Kalei for some spiritual healing along with my Western medicine because she recommended that I continue both. It was with her encouragement that I pursued the cause of the headaches further and did not ignore it and a CT SCAN was done on my brain. The doctors discovered a brain aneurysm; I consider myself fortunate, because gone undiagnosed, these are silent killers many times. Kalei also taught me many meditating techniques to help with the pain of the headaches that are invaluable. She is a plethora of information; I continue to use these techniques for varies aches and pains, it has been extremely helpful. When I was having severe pain, she would stay with me on the phone and do the chants with me to help relieve the pain of my headaches! Mahalo Kalei! Attached is a picture of the altar in our living room with your drawings and a lava stone beneath the Pele drawing.